This 1928 Security #5 is Twist-fill in Red Mottled Hard Rubber. Inside the light yellow Bakelite cap-top is the check protector with it’s rotating blades used to perforate the check so it could not be altered. GFT, including the spring loaded clip. Medium, extra-flexible nib. New-old-stock. Mint. Shown with cap on top of cap removed so you can see the check protector mechanism. 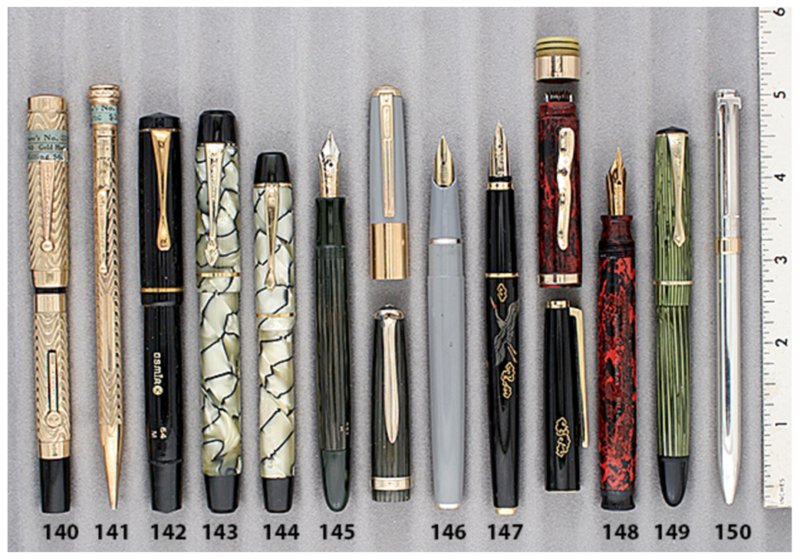 This entry was posted in Vintage Pens and tagged Catalog, Catalogs, Fountain Pens, Go Pens, GoPens, On Point, Vintage Fountain Pen, Vintage Fountain Pens, Vintage Pen, Vintage Pens. Bookmark the permalink. Follow any comments here with the RSS feed for this post. Post a comment or leave a trackback: Trackback URL.